Will the world’s greatest player and Barcelona’s new prodigy play well together? 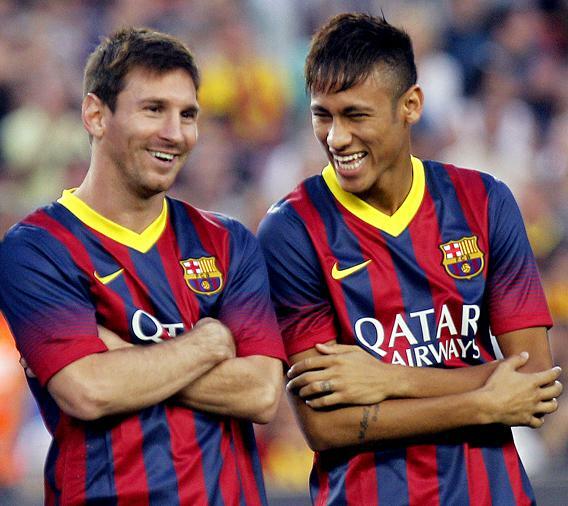 New Barcelona teammates Lionel Messi and Neymar da Silva Santos are all smiles now, but for how long? Lesson No. 1: Know your place. The biggest star in Brazilian football began on the bench at Barcelona. Neymar had to watch as his new team put six goals past Levante before halftime. He will have paid close attention to Pedro, who played on the left of Barcelona’s front three. A few days before, Neymar had said, “I really like Pedro a lot. He is capable of doing everything on the pitch.” He may have come to take Pedro’s place, but at least he’s trying to be nice about it. In the 12th minute, Lionel Messi twisted away from a defender and angled a pass into the path of Pedro, advancing into the penalty area from the left. Most forwards would have shot at goal. Pedro made as if to shoot, then clipped a first-time pass across the 6-yard box, where he knew Messi would be arriving to sweep it into the net. That’s how you play with Messi. Will Neymar, the 21-year-old prodigy, play this way? Can he? Should he? Zlatan Ibrahimovic has won 10 league titles in 12 seasons in four different countries. In his career, there has only been one place he didn’t shine, and that was in the shadow of Lionel Messi. Forced to the periphery by Messi, Zlatan boiled with resentment and eventually blew up at Guardiola. (Zlatan: “You haven’t got any balls! You can go to hell!”) He was sold to Milan at a loss of €40 million. His place was taken by Valencia’s center-forward, the Spanish World Cup winner David Villa. Already familiar with many of Barcelona’s players from the national team, Villa would surely adapt more easily to Barcelona’s peculiar culture. Villa had scored more than 250 goals as a central striker for Sporting Gijon, Zaragoza, Valencia, and Spain. He knew when he arrived at Barcelona that he would be playing as a wide attacker, with Messi in the middle, and he started well. While his scoring rate dipped from the rate of two goals every three games in his last two seasons at Valencia, to closer to two in five, he finished the season with league and Champions League medals and a sweet goal in the European final against Manchester United. In his second season Villa broke his leg, and returned after the summer break in the tentative form of a footballer who needs to play his way back to fitness. After several substitute appearances, his first start came in September against Granada. Barcelona had already missed several chances when the ball came to Villa on the left corner of the penalty area. He dribbled into the area with four touches and tried to find Messi with a side-footed pass that was blocked by the converging defenders. The ball ricocheted and Messi darted onto it, but his control let him down and it bounced behind for a goal kick. Messi’s scream of frustration probably had more to do with his own mistake, but for whatever reason, he then decided to take it out on Villa. “First time! First time!” he shouted. Villa looked nonplussed. “If I bring it to you …” Messi furiously cut him off: “First time!” Villa yelled back: “I couldn’t control it! Jesus! Are you serious? One, two touches, then I give it!” The blood had already drained from his face. It’s not easy getting reamed out by the world’s greatest player in front of more than 70,000 people. Even a World Cup winner shrinks before the scorn of a genius. Villa played less and less for Barcelona as that last season wore on, and in the summer he joined Atletico Madrid. Last week, Atletico played Barcelona. Seven minutes in, Villa scored the opening goal and, ignoring the fashion for players to mark goals against their old club with solemn restraint, he celebrated wildly. At 21, Neymar has already scored 161 goals for Santos, Brazil, and now Barcelona. It’s a phenomenal number: twice as many as Romario had scored at the same age, and three times as many as the 21-year-old Cristiano Ronaldo. Neymar, the prodigy, is also ahead of where Messi was at 21. He has played with successful teams, winning his state championship, his continental championship, and most recently the Confederations Cup with Brazil. He was named best individual player at that tournament, adding to a hoard of individual awards: top scorer in Brazil, Brazilian player of the year, twice South American player of the year, FIFA’s Puskás Award for the best goal scored anywhere in the world in 2011, a finalist for that same award in 2012. Neymar is just five years younger than Messi, but he belongs to a different era. It doesn’t sound like a lot, but as the speed and volume of human communication increases toward infinity, half a decade now constitutes a massive generation gap. Neymar’s Instagram account has 2.4 million followers and more than 1,600 posts. Online at least, Neymar likes to share. We can see him playing with his 2-year-old son, hanging out with teammates, posing with fellow members of the Nike family, barbecuing with Dani Alves, shivering in ice baths, modelling gear from sponsors. There are memes, action shots, inspirational sayings. Most of all, there are selfies—so many selfies. Laughing, pouting, gurning, yelling, eyebrows up, eyebrows down, tongue in, tongue out. For every conceivable human emotion there exists somewhere a selfie of Neymar expressing it, wearing a combination of hat and shades you haven’t seen him in before. There is only one post on Lionel Messi’s 2-week-old Instagram account. It’s a video of Messi meeting the Pope. Neymar has two seemingly irreconcilable missions at Barcelona. First, he must fit into the world’s most sophisticated team without disturbing its delicate ecosystem. Second, he must keep playing the kind of football that persuaded Barcelona to pay €57 million for him. Blessed with preternatural balance, touch, and acceleration, Neymar is an entertainer who takes obvious joy in beating his man. He will stop the ball and invite the defender to take it off him, the way George Best used to do. Teammates don’t always enjoy that, but crowds love it. A coach might say that one of the most exciting things about him is how much room he still has for improvement. At 140 pounds, he is the lightest player on a Barcelona squad that is famously the shortest in Europe. Like a lot of players with great acceleration, he lacks stamina, and his tackling is a disgrace. At the Confederations Cup, he committed more fouls than any other player. It’s hard to stay mad at Neymar, though. Look at his 2011 Puskás Award goal, a 40-yard run and one-two past four men. Look at the way he beats the last defender with a trick the guy has probably never seen before. This is sheer superhero football, the kind kids dream about. Messi plays the kind of football that only other masters can fully appreciate. It’s not simply that he’s technically brilliant, with bullish strength packed into a compact frame and instant, insectlike reactions. Perfection in possession is just the beginning. Messi is also the best player in the world during the 98 percent of the game when he doesn’t have the ball. That doesn’t mean he runs a lot. His central role at Barcelona allows him to stay close to the box, so he rarely has to dart more than 20 meters at a time. While others chase, Messi lurks, saving his energy for the decisive moments. No such moment ever catches him off guard. He’s in a sustained flow state that nothing can disturb (except, perhaps, a teammate hesitating a little too long over a pass). In that trance he thinks too fast for his opponents to keep up. He doesn’t respond to provocation, and he doesn’t play to the crowd. He doesn’t even dive. Playing this way match after match, Messi has recalibrated the limits of the game. Five years ago, nobody would have believed any player could score 73 goals in a top-level season. It’s a tally that belongs to the days of chain-smoking defenders and goalkeepers in flat caps. Messi is the first to acknowledge how much of his success he owes to the team around him, which comprises several brilliant individuals working together to multiply his impact. The ball usually comes to him from Xavi or Andres Iniesta, the best creative midfielders in the game, while Dani Alves’ tireless raids down the right give him a third major supply route. Then there are the wingers. The classic winger gets the ball, runs at his man, and slings a cross into the box for the center-forward. Winger is traditionally a fun position, often associated with lazy glory-boys. Barcelona’s conception of the winger is a little bit different. Barcelona don’t play many high crosses; it’s too much like pinball. In their system, the wingers act as decoys. By staying close to the sideline, they force the defenders to spread across the width of the field, and that creates space inside for Messi to play. Teamwork implies self-sacrifice. Most of the self-sacrifice in Barcelona’s team is done by the wingers. It takes discipline to stay on the edge of the game when instinct tells you to rush into the thick of it. It takes humility to sweat in an invisible cause, knowing that your most likely reward will be to hear the crowd sing the names of your teammates. It’s not that Barcelona’s wingers are necessarily water-carriers, but you sense that if there ever was water to be carried, Pedro would jump up and take two loads so that Messi could save his legs. Now, this will be Neymar’s role. As Giovanni Trapattoni says, “There are some players who sing, and some who carry the cross.” It looks like Barcelona just hired Mick Jagger to walk the road to Calvary. Unless someone is planning a major rethink. Sandro Rosell has been Barcelona’s president since 2010, and for him the signing of Neymar was the fulfilment of a dream. European club presidents battle constantly for status, and the market for superstars is their own little Champions League. Neymar joining Barcelona was a black eye for Florentino Perez, the president of Real Madrid, and a feather in Rosell’s cap. And this time, Rosell would get all the credit he deserved. Neymar was not the first Brazilian superstar Rosell had brought to Barcelona. Ten years ago, Rosell was a Barcelona vice president in the administration of Joan Laporta. That summer, the contacts he had developed in his previous career as an executive with Nike enabled Barcelona to beat out Manchester United to sign Ronaldinho. Laporta and Rosell were from the opposites-attract school of political duos. Laporta is a charismatic charmer, a showman and back-slapper, a broad-brushstrokes, big-picture kind of guy. Rosell is a backroom type—serious, intense, a details man. If Laporta was the pretty face of the board, Rosell considered himself the brains. The stresses of running the club soon strained the relationship. The brains began to brood that the face was taking too much of the credit. The face talked about democracy but seemed to think it was running the whole show. Ronaldinho—Rosell’s signing—would twice be voted FIFA World Player of the Year. In 2006 he inspired Barcelona to their second Champions League title. But Rosell wasn’t there to share in the glory, because he’d quit the board in the summer of 2005, after falling out with Laporta. In 2010, Laporta had to step down upon the expiration of his second term in office, and Rosell’s long exile ended as he was elected club president with 61 percent of the vote. The two men now hurl insults at each other, with Rosell accusing Laporta of wrecking the club’s finances with irresponsible management and Laporta calling Rosell neurotic, immature, and undignified. It all sounds like so much squawking in the henhouse, but Barcelona’s future rests on the outcome of the Rosell-Laporta feud. And that future depends on whether the club cuts itself off from its past. 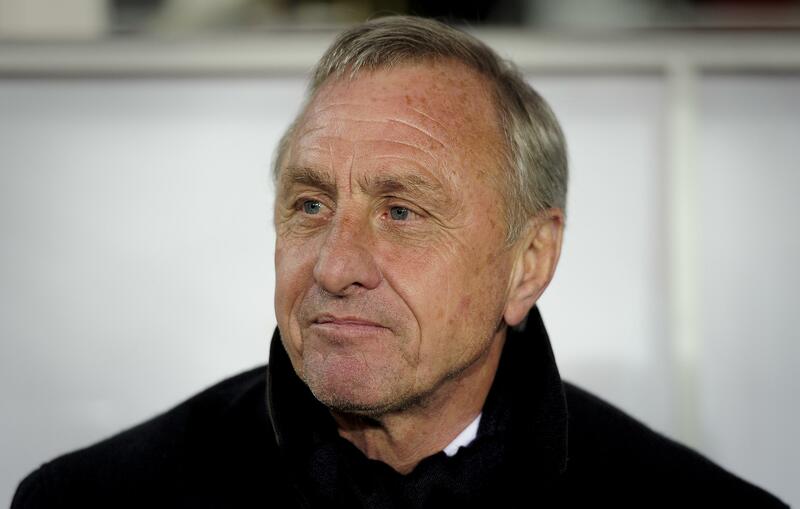 Johan Cruyff is the most influential individual in European football history. What sets Cruyff above other great footballers is that his influence continued to grow after he stopped playing. You could argue that in his varying incarnations as player, coach, stylistic architect, and power behind the throne, Cruyff can take credit for eight European Cup wins: four each at Ajax and Barcelona. That gives him a personal tally just one less than the record held by Real Madrid. On the field, Cruyff helped Barcelona win the league title in 1974. From the dugout, he led them to their first European Cup in 1992, and imprinted on them the style of play that has become their trademark: attacking football, using quick, short passes, usually in a 4-3-3 formation. When he hasn’t been directly employed by the club, he has lectured them through the media. There have been times when the club hasn’t wanted to know. Cruyff didn’t get on with Josep Lluís Núñez, the club president from 1976 to 2000. He didn’t have much influence over Nunez’s successor Joan Gaspart either. When Laporta came to power in 2003, Cruyff at last had the presidential ear. Laporta appointed only two coaches in his seven years as president. Frank Rijkaard and Pep Guardiola had both been key players in teams managed by Cruyff, Rijkaard at Ajax in the 1980s and Guardiola at Barcelona in the 1990s. Neither had previously distinguished themselves as coaches. It was Cruyff’s insistence that these men shared his privileged level of insight that persuaded Laporta to hire them, and to back them in the face of initial skepticism. Both would lead Barcelona to brilliant success. In the final months of his regime, Laporta bestowed on Cruyff the title of honorary president-for-life. One of Rosell’s first actions as president was to propose a motion to revoke that honor. Cruyff renounced his title before Rosell’s board could take it from him. Cruyff was now outside the tent. What he has been doing there would have come as no surprise to Lyndon Johnson. Sandro Rosell talks about a lot about “Barca DNA.” A great deal of wishful thinking is embedded in the phrase. The implication is that Barcelona’s superiority is somehow hardwired, when there is nothing hardwired about it. The Barcelona system is not a biochemical code that could survive locked in amber for centuries. It’s a culture, a set of ideas that are learned and passed on. It’s nothing more permanent than that. Throughout their history Barcelona have been animated by other ideas, but this is the only one that has worked. Each of their four Champions League titles has been won with either Cruyff or one of his protégées in the dugout. Now Cruyff is out in the cold, and Rosell has even fallen out with Guardiola. Those feuds are not the only reasons why many Barca supporters regard Rosell’s regime with unease. Rosell has sold the shirt to sponsors and festooned the outer walls of the stadium with gigantic advertisements. He has imposed strict conditions on who can apply for club membership. He has angered some players by declining to renew the contract of Eric Abidal shortly after the player had recovered from a liver transplant. Rosell said: “We treated him as a footballer, not someone who was ill, because that is what he asked of us.” Whether in tribute or protest, Dani Alves now wears Abidal’s old number 22. Into this house divided walks the beaming figure of Neymar, the choice of an increasingly unpopular president. Cruyff, as ever, has not hesitated to venture an opinion. The headlines were variations on the theme of “Cruyff says Barcelona should sell Messi.” In fact, he said categorically: “I wouldn’t have signed Neymar.” The comment about Messi was meant to illustrate a hypothetical: The only situation in which Cruyff would have signed Neymar would be one in which he was already planning to sell Messi. Was that what Rosell and his board were thinking? Around Messi, old certainties are dissolving. Guardiola has left for Munich. Xavi is getting old. The team was destroyed in the European semifinals by FC Bayern and is lacking in defensive power and depth. Instead of reinforcing the obvious weaknesses, the club president has signed a young attacking superstar who could scarcely be more different from Messi if he had been born in a different century, on another planet. Neymar wouldn’t be a real superstar if he didn’t want to encroach on Messi’s central turf. After all, the best players play in the middle. Do Barcelona reconfigure the formation to get Neymar into the center alongside Messi? Even if Messi didn’t feel threatened, wouldn’t it be a rather radical step to change a winning system for the sake of one player? Correction, Aug. 29, 2013: Due to a production error, a photo of Michel Platini was mistakenly identified as Johann Cruyff. The correct photo has been substituted. Already natural opposites in so many ways—Brazil vs. Argentina, Nike vs. Adidas, selfies vs. the Pope—Neymar and Messi, through no fault of their own, have come to symbolize the division within Barcelona itself: Rosell vs. the Cruyffians. Will the club be big enough for both of them? If Messi flags, it damages the team. If Neymar flops, it damages the club president. It seems impossible that Barcelona might already be considering the future beyond Messi. And yet, as Messi himself keeps showing us, in football anything is possible.